Found B & W photos blown up, cut out, colored with photo dyes, acrylic, markers and pens. 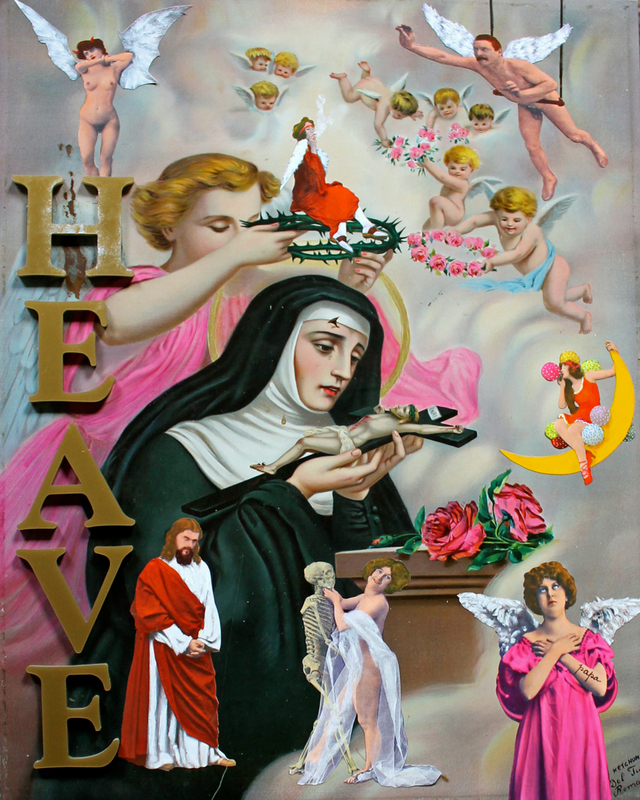 These images are mounted on a found, somewhat rusty 18 x 24 tin lithograph of St. Rita of Cascia. The gold letters are painted 1/4 inch thick plastic. St. Rita is the patron saint of the Impossible, the hopeless, and, recently, baseball. She is a Saint for our times for the promise of her miraculous intercession is urgent. Behind her is a heaven with very narrow entry points (maybe by now closed or sealed) and some less then perfect angels who sneaked through. "Judge not, that ye shall not be judged, " the oft quoted book says. Politicians, hypocrites, and errant holy people take note. Some less than ideal Christian souls might be forced to sit on the left of the Lord in the outer boroughs of heaven, but they ARE sitting there. That's cool. Cooler than hell. Not that the Bible says so. St. Rita was born in 1381 and died in 1457. While in the convent, Rita said, "Please let me suffer like you, Lord". Suddenly, a thorn from a figure of the crucifixion of Jesus Christ fell from the crown of thorns and left a deep wound in Rita's forehead. Yikes. This wound never healed. Added to the physical pain, the wound gave off a horrible stench. The day she died, the smell became as beautiful a scent as the scent of roses. Hence all the pink. The image by Carlo Del Tufo was painted in 1910, shortly after her canonization in 1900. It was lithographed on tin by New York lithographer John Duffy.